I want to give a little context for the late talk about cymbals; mainly, what I think is good and bad, and my thinking when hand-selecting Cymbal & Gong brand cymbals for people who want to buy them through this site. 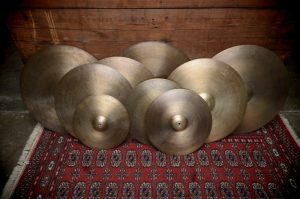 First, I’m talking about cymbals for all genres of acoustic and moderately amplified music, and for recording— meaning the full dynamic range of the cymbal is used, from extremely soft to as strong as the cymbal can play with a musical sound. I don’t factor for extreme power drumming situations, arena volume, or for relentless bashing with heavy sticks. My standard for a good cymbal tone for this purpose comes mainly from jazz recordings of the 1950s and 60s, and from drummers who continued using older cymbals into the 70s. The main questions are: how does it sound, how well does it do all the normal things you expect a cymbal to do, how does it handle when playing with an ensemble, and does it project and blend appropriately for its purpose. Cymbals I choose for my own use have to meet the Mel Lewis standard— everything is a ride, everything is a crash. Within that I have my own categories of primary (your main cymbal on which you will do most of your playing), secondary (“left side” cymbal, contrasting the primary— usually smaller, and either heavier or lighter, maybe more idiosyncratic), crash (good for stronger, faster, more cutting accents and light riding), and hihats (obvious). Overall impression of the sound can be clean or complex, refined or pleasantly chunky. Should have a focused ride sound free of unpleasant overtones, an excellent stick sound, bell sound, shoulder of the stick accent sound, and an explosive but musical crash. Controllability is important; I don’t want the wash to easily overwhelm the stick sound in normal playing. Hihats should have a solid foot sound, and a good sizzle when played half-closed, and preferably a good bell sound. Performance should be excellent in a dynamic range of very soft to very strong. More broadly, do I like it? Do I want to play it, or do I want to move away from it? How comfortable is it to play? Do I have to adjust my touch for it? Things I consider to be flaws include: an overall unpleasantly crude sound, overall poorly defined sound, unpleasant overtones, over-brightness, over-darkness, metallic, washing out easily, hard to control, won’t crash, piercing bell sound, weak bell sound, unpleasant gong-like overtone, too much noise/trash in the tone, too refined/glassy a sound to the point of having no body; too loud or too soft when played normally with other cymbals— especially when the crash sound is unbalanced, either underwhelming or over-loud. Too one-dimensional in either sound or function. Sounds and handles poorly at very soft volumes. Any general feeling of obnoxiousness or over-delicacy. The Cymbal & Gong cymbals I own and have played hit a lot of sweet spots very consistently. Other cymbals I’ve played, owned, and gigged with over the past 20 years— which is a lot of cymbals by all major manufacturers— often have an amazingly hard time hitting even a few. That’s why I’ve been complaining about it, and it’s why you saw me suddenly overjoyed when I found the C&G cymbals a couple of years ago.